That's probably because his Job and his Mission are so far beyond that concept. Have you ever heard: 'Captain Kirk to HR please, Captain Kirk please!' Not either? Well, ever wondered why the Crew of the Enterprise did not need HR? Because this crew had mastery, autonomy and purpose and their mission was too unpredictable to be controlled centrally. The crew of the Enterprise worked just like the people who designed the Way of the Resourceful Humans - creatives operating at the bleeding edge of Innovation inside the videogames industry. Based on their lessons the RH-Way proposes to run your organisation on Resourceful Humans alone. It asks to dare more democracy in the pursuit of self-organizing, high-impact Teams. Resourceful Humans demand to be enabled, not administrated or strategically partnered with by a Human Resources Function! Our goal was simple, but hard. Enable a healthy culture of evolutionary and revolutionary innovation in the videogames industry. With 600+ people conventional wisdom dictated we should adopte the HR Business Partner Model. Too often, however, professional HR corelates with the genesis of structural ossification in companies. Size, hierarchies, apathy and ignorance take hold. We therefore adapted the approach of Itay Talgam, the successful Israeli composer, who advocates the best orchestras perfom at their peak without a conductor. Note he did not say the best musicians. To enable the best self-organizing democratic teams, we as an HR Team had to be the most self-organizing, democratic team. We had to rise beyond being a function to becoming a mindset. 'I shall look as if I were dead, but that will not be true. You understand? It is too far. I cannot carry this body with me. It is too heavy.' Like Saint-Exupery's little Prince, we wanted to leave a legacy of purpose, mastery and autonomy in the organisation - but without having to supervise it. We therefore set ourselves an expiration date for HR as a function, transformed the organisation into small self-organizing units with linked development contracts, adopted agile, turning everything into project formats, outsourced HR admin and transfered the value-adding HR skills directly into the teams. We topped everything off with a company wide appreciative inquiry and design thinking prototyping session that resulted in a new social bonus model where everybody could reward their peers with stars on a quartely basis in an online tool. These stars were monetized based on the EBIT at the end of the year in a transparent process. Presto, no more central adminstration. No more performance reviews. Instead an ongoing 360 degree feedback in the words of the people who do the work and leaders as coaches. "If HR 3.0 is your answer to my problems...I want my problems back!" Way too often the Human Resources function is in charge of administrating problems that come with organisational growth or are intrinsic to command & control management structures. Size. Hierarchies. Apathy. Ignorance. So, What should we do? We should stop treating the symptoms and focus on the causes. Let's rewind to the lesson of successful startups. No entrepreneuer ever wanted shared services. An entrepreneuer wants a healthy culture of innovation. An evolutionary one that sustains the successful products and services and a revolutionary one, that engages in inventing the future. A culture that can constantly reinvent itself, while staying alive through that rejuvenation process. It's therefore time HR approached its own existence in the way the organisation shoud be run holistically. HR's business is not return on investment. HR is about people and it should live up to its responsibility to shape, design and enable cultures of innovation, in a new balanced spirit of enterprise between people and profit. How would we talk, walk, act and organize if we approached organisation as a group of people who should be enabled to run their own business with all the necessary skills directly in the value-creation chain, closest to the customer. Not with cental HR. Not even with decentralized HR, but with a complete distribution of HR skills into small, self-organizing teams. Adding value comes by looking outside the company as much as inside. The RH-Way is all about understanding that the network of talent, which is your organisation, in itself is a social medium. This group constitutes the organisation, these people create structures, lead and innovate. There is no such thing as 'the organisation' - Talent and therefore Resourceful Humans are everything. By removing all barrierers and folding the customer community into your internal community, Resourceful Humans create a talent-centric setup. Either you create or you sell, nothing should stand between people and their customers. Creating this environment is the Job of the RH enabling Change Force! The solution to organisational issues related to size, hierachies, apathy and ignorance is not HR 3.0. It's not incremental change. It is not more of the same. It is NOT Enterprise 2.0. The answer is a reboot of how we think about organisations, our business ethics and how we fundamentally design and run the enterprise. The answer for existing organisations is a transformational framework from Human Resources, via a Hybrid, to a pure Resourceful Humans working ecology. The Resourceful Humans concept enables an evolution from central command & control power structures, via decentralized design, to an organic distributed federation of self-organising teams. Functions such as HR, Marketing and Finance become competencies in service of fast-acting teams. Think of it as the difference between a Starfish and a Spider. A spider has a centralized body with legs. Cut off the head, it dies. A starfish is a distributed organism, major organis are replicated throughout each arm. Cut it in half and you get two starfish. 1. I possess the choice to pursue what I love doing and attach myself to like-minded, competent people. 2. I have the neccessary information to make good decisions. 3. I will fairly benefit from the measure of my efforts. Holistically, it means teams are free to gravitate towards topics closest to their intrinsic motivation, enabled by democratic decision making and tools, informed by transparent information, networked through self-organized contracting based on mutual commitments, and fueled by the prospect of entrepreneurial gain-sharing, will have the greatest possible business impact. By implementing such a democractic management framework, the RH-Way allows the sustainable co-existence of evolutionary and revolutionary innovation. The former required to strive for process excellence in existing products and services, the latter giving te space for game-changing ideas. Core component of the RH-Way's four phases is the Dream-Adapt-Evolve loop. The first step is to seize the opportunity that provides a meaningful contribution, then move into rapid prototyping and embed short-spaced sprint cycles for fast-reviews and design iterations. Through the social checkpoint of free association, ideas will stick through more talent attacahing themselves to the idea and therefore grow or remain unconvincing in the internal talent market, whither and die. The RH-Way also utilize an appreciative method called the "3Ys" - asking simple questions to probe the product at every point of development. It acts as preventive measure to slip into 'doing things right', instead of 'doing the right thing'. When the Y-Questions can be answered simply and clearly, the teams can establish clear networks of contracts between themselves and will buy into each others Visions - driving the business forward through and ecology of shared belief. As a product matures, talent has the choice to remain with the maturing business and adopt evolutionary innovation, or undertake the entrepreneurial risk of pitching/attaching to a new revolutionary idea in the business ecology. 2. A temporary RH Change Force. Facilitators, Mediators, Keepers of positive Momentum towards RH and Guardians of the organisational peace. 3. HR becomes not only agent of the Starfish ecology but literally becomes the ecology. As more teams move past Baseline, HR distributes its competencies directly where they are needed - in the value-chains of the temporary teams. Human Resources literally becomes Resourceful Humans. Resourceful Humans pre-empts the issues of size, hierarchies, apathy and ignorance by creating a a peer-creation culture. It enable the mindset and tools for a healthy self-sustaining culture of Innovation. Regardless of hierarchy, everyone will have the same opportunity to approach work in the most innovative, productive and efficient manner, based on networks of self-organized contracts with shared goals. Purposeful accomplices who can design their own work environment to create the best possible product of service, will not employ normal management tools and techniques. What does an environment of Resourceful Humans look like? Each teams resembles a circle: independent and autonomous. Once you join, you’re an equal. Its then up to you to contribute to the best of your ability in service of the shared idea. Ideology is the glue that holds distributed organizations together. It consists of authentic, often unarticulated, belief in the purpose of the team and organization's benefit to the community. 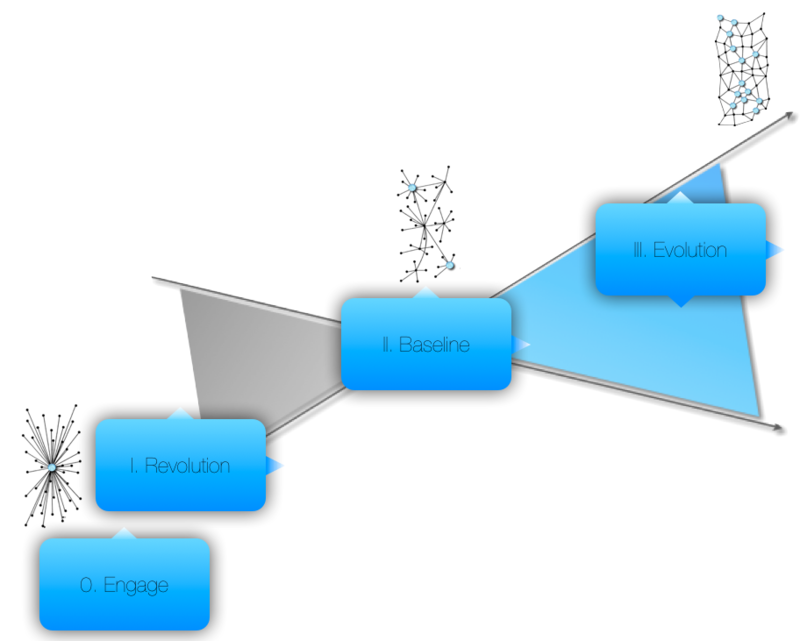 Not Central Strategy, but fluid, mutating Network. Resourceful Humans do not perceived organizations as confining constructs, but as enabling platforms - semi-permeable membranes. The Resourceful Humans Concept lets them associate freely to the enterprise in whatever form they chose, as long as they are accepted by the receiving team. Leaders of Resourceful Humans-centric organizations are vastly different from traditional executives. A catalyst is any element that initiates a reaction without fusing into that reaction. In open organizations, a catalyst is the person who initiates a circle and then fades away into the background. They generated ideas and then allow the circle to follow through. They get a decentralized organization going and then cede control to the members. Letting go of the leadership role, the catalyst transfers ownership and responsibility to the circle. The catalyst is an inspirational figure who spurs others to action. Circles don’t form on their own. A catalyst develops an idea, shares it with others, and leads by example. A champion is relentless implementer, promoting a new idea. Catalysts are charismatic, but champions take it to the next level. Catalysts inspire and naturally connect people, but there’s nothing subtle about the champion. He is a natural people person, salesman and builder. He translates vision into reality. People in a company living the RH-Way asked to design a radical new bonus system, as none of the traditional models seemed to be fair to them. They created an online platform, where each employee could log onto. Depending on their seniority, each employee had a number of stars at his disposal to reward fellow employees with online on a quarterly basis. They could award stars to whomever and add commentaries as to why they awarded them. The Revenue and Profit statements of the company were available online, and at the end of the year, based on the EBIT, each star transparently received a monetary value. The employees created their own social feedback and bonus distribution platform. No more arguing with managers about unfair apraisals. No more bell-curves. No more intransparent and complex bonus calculations and administration by HR. Resourceful Humans became the solution. 1. In teams of 3-5 people show them the below RH-Question Cycle of Dream, Adapt, Evolve. 2. For the Dream - "Which Zone are you in? ", print-out the below "HR Zone to RH Zone?" table and let the teams assess the status quo of your organisation on its basis. Let the teams present their views back to the rest of the group. 3. For Adapt - Show them the following 'Field Manual of a successful RH Pilot Team. Ask them to reflect on it. What could an RH Pilot in your organisation look like? Framing question: "If you could design your work and work environment so you could improve your business, not incremental but exponentially, what would you change? (Give them one hour to walk about, get inspired, talk, anything really, but to come back and craft an actual, tangible prototype by any means available to them other than PowerPoint, Keynote, etc...the point s actual crafting together) Give them 5 minutes to present it to each other." a) One a scale from 1-5, where 5 is the most valueable and 1 is crap, how valueable did you find this exercise? b) One the same scale, what do you think you contributed to making this a valuable exercise? c) Now ask them to distribute their Pretzels to the people in the team they felt made the exercise most valuable. Let them do it with everybody else watching their distribution and let them explain why they awarded them. e) What RH ideas could your team come up with that it could put into practise tomorrow morning? Voila, your very own two hours "Resourceful Humans Readiness Check". In case you want to try an even shorter, practical approach in a 1:1 situation - use the RH Canvas (below). It is designed to be used in a dialog situation. The manager and her team-member work their ways from left (team-member) and right (manager) towards the middle together. Each asking one another probing questions about the purpose of their mutual endeavour. Arriving at the center, they hopefully found common ground for mutual maximizing of potential for the talent and the enterprise. Then they can contract on specific actions to enable that potential. MixMashup inspired me to get back to this 2012 Hack....I love it; Great job and design efforts. HR RH mirror effect is working fine and dera to myself. The HR Function needs to reboot itself as an ambassador for Democracy and Resourceful Humans in service of sustainable global Communities.